If you’re running Node on Windows (who isn’t? [don’t answer that]), updating Node.js & NPM to the latest version is a little different than on Linux or OSX. In some ways, it’s easier than you might think. 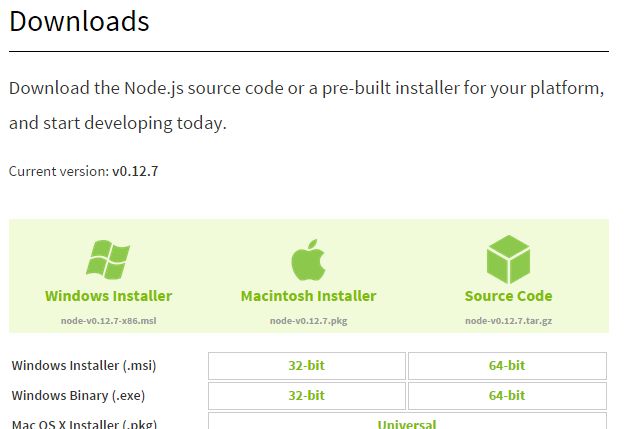 To update these, the easiest way I have found is to download the latest version of Node.js (NPM is included) from the Node site here. Choose 32bit or 64bit (depending on your setup) and install. Now if you run “node -v” or “npm -v” you’ll see you have the latest and greatest. A simple solution instead of deploying your code to apache or IIS is to install a local http server. http-server for Node.js is a fast, easy install and app that will allow you to use any directory as a http://localhost. Now using command prompt or terminal, browser to a folder with some html you want to serve as http. (ie: c:\someproject\). Open your browser and visit http://localhost:8080. Run http-server –help to see the other options available for running.